Colored coins, chromawallet, coinprism, NXT Asset Exchange, Mastercoin, Counterparty… tens of projects are working on asset tracking, transfer and exchange systems. What are they doing? Will it work? 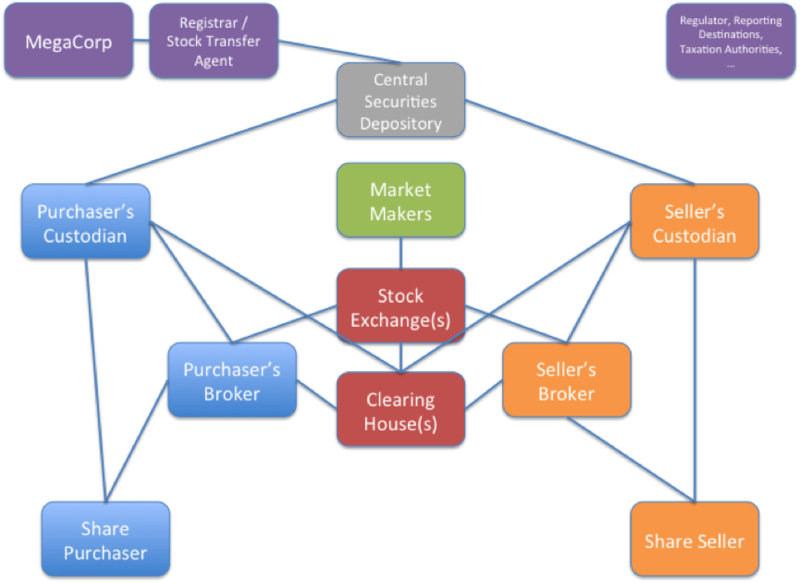 There are surprisingly many parties involved in the safekeeping and exchange of securities. What would the picture look like in a “decentralized world”? At core, I think the system is all about assuring “performance”. That is… it’s all about making sure that people actually deliver on the promises they make when they enter into a trade. Recent controversies might make this seem hopelessly naïve – and they show that ensuring fairness in exchange is important – but assuring performance is the core of the aspiration. And to deliver on this aspiration, today’s system is based on a closed, centralized model. I talked about it here and also argued Mt.Gox model was even more centralized than the mainstream system. We’re now seeing serious projects work on this problem. Perhaps revisiting the fundamentals will help us predict which of these projects will prevail? Why do we have exchanges in the mainstream world? There are lots of valid answers (liquidity, fairness, …) but none of this matters if you can’t be sure a trade you make will be settled. After all, what’s the point of agreeing a trade with somebody if they can just change their mind afterwards if it suits them? “Obligation to settle: A member firm shall ensure that every on Exchange trade effected by it is duly settled.” Obvious, perhaps… but it needs to be said! Escrow: The model I outlined in my piece earlier this year was essentially an escrow scheme. You place your Bitcoins beyond reach and they are either delivered back to you when your bid/offer expires or are delivered to the buyer. The trick here is in choosing the escrow “agent” (or agents…) carefully. Clearing: This is how the The London Stock Exchange does it. In certain situations, members don’t even need to own the securities they’re selling at the time they trade them; they just need to make sure they deliver them as promised on the day of settlement. This model works because there is a closed group of trusted and well-known entities. However, there is clearly a risk: what happens if one of the participants goes bust between trade and settlement? That’s what a clearing house is there to solve, amongst other things. It keeps a close eye on its members, requires them to contribute to a “default fund” and steps in to make the other members whole if one of them fails. Now, when we look at some of the most vibrant projects in the Bitcoin and cryptocurrency world, we see something interesting: a large number of them are working on representing non-crypto assets – such as securities – on the blockchain – They’re building out the vision of a decentralized general-purpose asset ledger. A token – something that represents an asset. Perhaps 100 shares of IBM Common Stock or ownership of a particular car. An issuer – somebody that makes a promise to confer the rights and benefits associated with that asset to whomever holds it at any given point. “I will convey whatever benefits I enjoy through my ownership of these shares to whomever holds the token”. So if I receive a dividend cheque, I pay it to the holder of the token. If you trust me to be good for this promise, you might be willing to purchase the token from me for $2m or so… the price of the IBM shares… owning the token would be just as good as owning the shares… and you could store it in your Bitcoin wallet and not have to deal with your broker any more! Now, it is unlikely that you’d trust such a promise from me. But if was made by a major custodian bank you might. But note: you do have to trust the issuer. So why bother? Why bother going to the trouble of building a decentralized asset ledger if you have to trust somebody at the end of the process? For me, the answer is that this approach might allow increased competition between issuers. Furthermore, moving disparate asset registers (custody records, vehicle registration databases, etc) onto a common architecture might enable innovations we haven’t yet considered. It’s too early to tell so we can all be grateful to the pioneers who are experimenting so we don’t have to. New Protocols Running Over Bitcoin. mastercoin and counterparty piggy-back on Bitcoin’s peer-to-peer network, double-spend protection and consensus system but their tokens are essentially independent of Bitcoins. A counterparty token is not simply a “tagged” Bitcoin. Entirely Separate Protocols. NXT and ethereum fit into this camp. I have no particular insight into the structure of any of these projects so let’s assume they’re all run by capable, honest people and further assume that we’ll see a future where assets of all types, including securities, will be represented on a blockchain-like decentralized platform. Then what? Presumably people will want to buy and sell…. To exchange. And that’s where things get interesting… because we have to solve the performance problem. We’re now in a decentralized, pseudonymous world… how do we ensure somebody who offers to buy an asset for a given price actually goes through with it and pays up? What is the crypto-ledger rule G5000? Is it possible to build a decentralized exchange on any of these platforms that has the strong performance guarantees we need? Can we build a decentralized exchange where a matched bid and offer inevitably lead to a settled trade? It we look at our three models from previously, “clearing” isn’t going to work (it is, by definition, centralized and reliant on trusted identities). “Prefunding” is also problematic – what happens if the entity you sent your assets to disappears? So it looks like “escrow” is the only game in town. Now, part of the solution already exists: we can construct “atomic” asset transfers using the Bitcoin protocol today. So I will assume exchanging payment and asset in a single transaction (“Delivery versus payment”) is achievable today on any of the platforms discussed above. But we need to get to a point where creating a valid transaction like this is inevitable once a bid and offer are matched. Coloring Bitcoins. The systems I’ve looked at don’t route bids/offers over the Bitcoin system so any matching will be done external to the platform. So it seems to me that “decentralized exchanges” on this model will have to require those posting bids or offers to demonstrate that they have placed the corresponding colored coins/Bitcoins in escrow with one or more acceptable third parties. There’s nothing that will do this automatically. So, it’s worth watchin firms like Xapo in the US and Elliptic in the UK. Professionally-run Bitcoin “cold storage vaults” such as these feel like “proto custodian banks” that could perform this function. The question is: can they devise a service that is sufficiently decentralized yet which still allows them to earn an income? New Protocols Running Over Bitcoin. My understanding of these systems is that they embed bids/offers in the blockchain and have a protocol definition that means matches can be determined unambiguously. Furthermore, the act of making a bid or offer locks the associated assets until the trade is resolved or a bid/offer expires… automatic escrow, if you like. Assuming I am right, then this does appear to offer the “inevitability” promise that I think is so important. But it is at the expense of polluting the blockchain with bids/offers. It seems inelegant to me that one would store transient data (time-limited bids/offers) in such a permanent form of storage. But perhaps there’s no other way? Entirely Separate Protocols. My working assumption is that NXT, too, works on the basis of bids/offers encumbering the associated assets until the outcome of the trade is resolved. With Ethereum, the answer to every question is, of course, “it’s Turing Complete so of course you can do it” but I need to dig a little deeper to be sure…. I think we’re going to see a market test: the colored coin approach is, in many ways, the most elegant as it uses the blockchain solely for storing/transferring the asset. It means a range of exchange types can be trialled (escrow, pre-funding, reputation-based? )… but none of them will deliver full “inevitability” of settlement. Perhaps consumers will care. Perhaps they won’t. Projects like mastercoin and counterparty look able to deliver on the “inevitability” promise but will it be at the cost of blockchain bloat? It will be an interesting few months ahead. A final thought… What if we simply don’t worry about it and price it instead?! The other approach is completely radical… instead of trying to force performance, why not model it as an option? We can think of somebody who posts a bid/offer but who then reneges as exercising an option to renege. This option clearly has value – if they would lose money by completing the trade as agreed, the option payoff is at least as much as they stood to lose! So is it possible to model the value of the option to renege and force participants to pay the option value up-front in order to post a bid/offer? Unanswered questions: to whom would the price be paid? Is there any precedent for modeling the “option to renege” in this way? What would be the liquidity implications? I said at the start of this piece that a new financial infrastructure is being built “hidden in plain sight”. For the reasons outlined above, I think the “exchange” aspect of this infrastructure still has a long way to go but we’re about to witness a fascinating experiment. ← Bitcoin Mining: The First Technology Platform That Works because it goes SLOW? Shouldnt prefunding work, so long as counterparties are sufficiently creditworthy? For example, would you be okay with prefunding at Bank of America or State Street? There are examples (e.g. Russia) where the stock market was running on T+0 settlement, and *everything* was prefunded. (In Russia’s case, this was because of distrust of other market participants to settle on time… or at all… it was all done on a good funds basis). Also, how can this article neglect to mention Ripple?! Seems like that platform has come the farthest with the token/issuer model. So I guess the advantage of the solutions in category 3 with their own blockchain(s), is that you can have a blockchain or multiple blockchains especially for storing data about trades that deals with Blockchain bloat. Also there is a rumour some of the organisations that work this way may be close to cracking blockchain bloat. I fundamentally believe trying to do everything on the bitcoin Blockchain is short sighted because of the mining economics and therefore has a limited shelf life. I’ll put you in touch with Stephan Tual, but I highly recommend checking out the video on http://www.etherum.org – they are creating tools to create your own blockchain, blockchain apps, and the exchange between all of those blockchains. Which is why the Bitcoin foundation think they’re trying to boil the ocean. I disagree, etherum isn’t… but some of the other things they’re trying to do might be. @peta – thanks for the comments. Great point re prefunding. Agree it can (and does) work when you have well-known, trusted entities. I didn’t do a great job of positioning the piece but I was trying to focus on the decentralisation problem…. i.e. how do you ensure “certainty of settlement” in a world where you don’t want to (or simply can’t) totally trust any individual entity? As for Ripple, fair cop 🙂 I did write about them here: gendal.wordpress.com/2014/04/19/ripple-is-hard-to-understand-but-its-worth-making-the-effort-theres-a-deep-insight-at-its-core/ The reason I didn’t mention them here is because they seem to be focussed on the international FX/payments space rather than positioning themselves as a generalised asset register. The other reason was that I don’t put them in the “exchange” box… they seem to be focussed exclusively on settlement and obligation tracking…. so if I were to issue IBM Shares, say, on Ripple, I’d have a way of transferring them between owners… but how would those owners find each other in order to trade? Coinprism is a service created by the Predictious company and implements their special take on Bitcoin 2.0 called Open Assets: https://github.com/OpenAssets/open-assets-protocol. Open Assets actually uses OP_RETURN to store data, which bloats the blockchain. @gendal – A Ripple gateway holds currency deposits and issues balances into Ripple… but there’s no reason that a Ripple gateway couldn’t custody IBM shares and issue a balance representing IBM shares into Ripple. Buyers and sellers could meet in the IBM order book, just like they currently meet to trade XRP in the XRP order book. You could trade securities on ripple with no modificaitons necessary. (Well… except modifications to securities laws : ) ) It’s actually the first and arguably most successful distributed exchange thats operating today. Now, this is far from a success story – it was likely an illegally conducted offering, and the gateway has since gone out of business – but it does show that ripple’s exchange can easily be used to issue and trade assets. @peta – thanks… very interesting. My dream would be for a ripple-like ledger built on a Bitcoin-like decentralised consensus system…. the best of both worlds! Actually, Ripple already runs on a decentralised consensus system similar to Bitcoin. It may look centralised because the best-known UI is ripple.com, but it isn’t. ripple.com is just like blockchain.info, a convenient entry point for using the Ripple network, but you can run the client (or alternative clients) locally if you want to. Ripple Singapore already trades precious metals / IOUs “backed” by precious metals on the Ripple network. @martijn – think we’ll have to agree to disagree on this. Ripple is an extremely elegant and very clever system (see the dedicated blog post from me to see how excited I am by it!) and I agree it *is* more decentralised in design than today’s banking system. But its underlying architecture (Unique Node Lists, etc) is inherently more centralised than blockchain-based solutions. This isn’t a value statement… they both have pros and cons… but they are qualitatively different. Furthermore, it’s possible that the Ripple approach is superior for real-world use — as you say the ledger already supports multiple asset-types far more easily than Bitcoin, where it has to be bolted on. But I return to my original point: the Ripple ledger with a blockchain-underpinning would be a great combination. I’m not sure how blockchain “Proof of Work” seems more decentralized than Ripple. It seems like an enduring systemic risk for the bitcoin ecosystem. Flawed in an enlightening way. Here’s a reductio ad absurdum for you. The option is obviously symmetrical, goes to both buyer and seller (the guy hitting your bid or lifting your offer is just as unfunded as you.. his is also a limit order, remember). So seller writes buyer a put struck at the trade price, buyer writes seller a call struck at the trade price.. and what does that mean? Well, buyer has a long position, but also a long put and a short call. And what is +put -call? A synthetic short position! So buyer is long and short, i.e., has no position. Reason analogously for the seller. @Nikolai – thanks for the comment. I’m not sure I agree with you that the BitShares/BitUSD system is offering something analagous to asset ownership. It’s more analagous to a Contract for Difference, right? i.e. I don’t own the asset. Instead, I’m party to a contract whose value (and expected cashflows if the asset were a bond/equity, etc) are supposed to exactly mirror that of the asset. So this is a derivative contract, not a security.